Kombucha is simple drink of ancient origin, a tea based beverage from Eastern cultures rennow for it’s refreshing and nutritive qualities. It has recently experienced a spike in population. Kombucha’s effervescent, slightly tart, slightly sweet, fermented probiotic drink! The subtle sweet and tart flavor helps the body to regulate itself by restoring and maintaining balance. Kombucha has fascinated people and cultures all over the world. For best results brew in small batches. It is not a curative. it is a raw, alive and unfiltered it is an adaptogen. 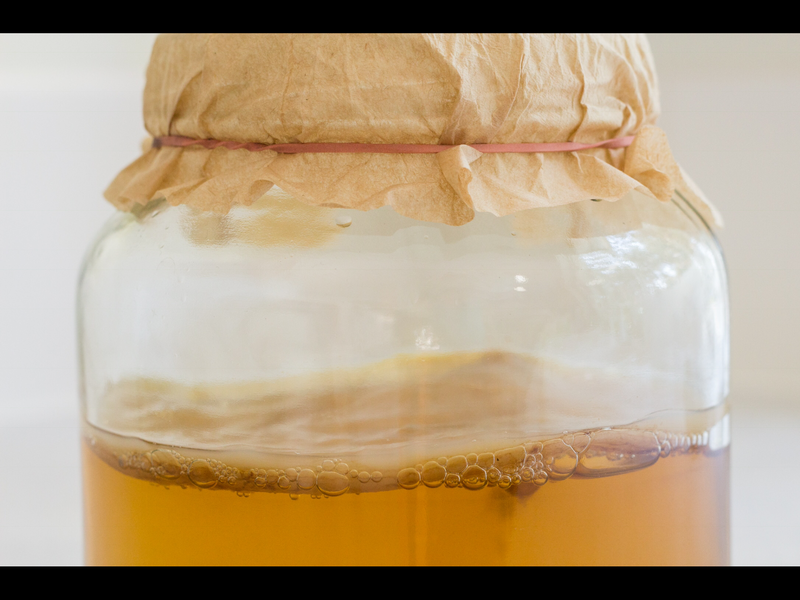 The SCOBY, or symbiotic culture of bacteria and yeast, is what makes the magic happen. You add the SCOBY right into the sweet tea where it will thrive. It will eat the sugar and tannins present in the tea and create all kinds of good stuff as byproducts! By good stuff, I mean B vitamins, enzymes, and antioxidants all ready to help keep your digestion on the reg and boost your overall immunity! Probiotics: Live bacteria that are beneficial to our digestive health. Antioxidants: These can help inhibit or delay cell damage that leads to a variety of diseases. Organic Acids: They aid in the digestion and stimulate the stomach to increase motor function. Glucuronic Acid: Which helps the body to eliminate toxins and increase collagen density. LEARN TO MAKE KOMBUCHA FROM HOME! As a daily regimen, it is way too expensive to buy at $4+ per bottle. The good news is that kombucha is really easy to brew at home. If you find yourself spending too much money on kombucha, give it a try! During the workshop, we will go over the many benefits of Kombucha (listed above and more) as well as go over step by step instructions on how to brew your own Kombucha from home for pennies compared to what they are charging at the stores. You will also have the opportunity to taste Kombucha during a workshop as well as a chance to ‘win’ a Mother to take home and start brewing yourself. At some workshops you may be able purchase your very own mother or a Kombucha Kit from my personal colony. Check back as more information about this will be added to the website soon….